I'm looking for an alternative for horses. Why not horses? the short answer is the gods didn't want to create them. The gods in my universe like to annoy humanity. 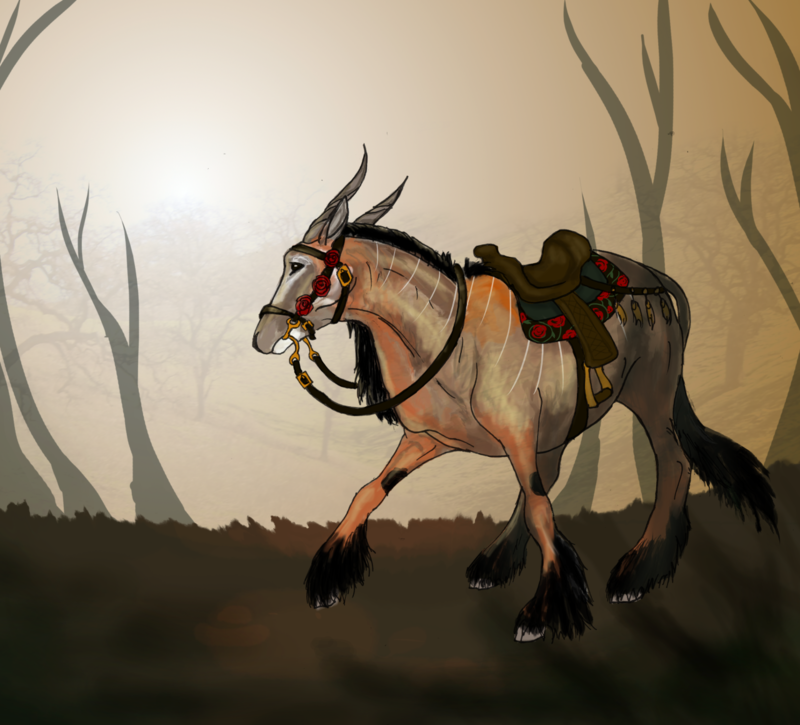 Horses only seem to really benefit them and not the other favored races, My humans are semi-nomadic with a culture of cavalry warfare including horse archery. I'm looking for alternative animals I might be able to justify in universe. So I found this question and it doesn't fully answer my own question. My world has two constraints not seen in the original question. My humans originate in a climate pretty similar to the savanna, north Africa and the Levant. Large open plains but very dry. So my restrictions for an alternative are, adaptable to a harsh dry climate, must be able to carry a rider over long distances, temperament that makes them usable on the battlefield and their gait must allow for mounted archery. It's not required they have all of the above traits out of the box. Humans first used wild donkeys for their chariots before switching to horses and it took ages to breed ones large enough to be ridden. So I'm willing to take the time to breed this animal into a formidable mount. Behold your savior - Taurotragus, the elands: Common elands (T. oryx) come from many parts of southern Africa (a region apparently irrelevant in your alternate world), including the Kalahari, and the 'giant' eland (T. derbianus, however, they're only slightly larger) is native to the savannas, scrublands and sometimes even deserts just south of the Sahel. The dry seasons can get very dry indeed, but that don't worry our antelope buddies none. Unlike camels, they can't directly store water in their body. They are, however, incredibly efficient at conserving water. Their feces is quite dry, their urine is highly concentrated urea, they can change their core body temperature with the weather and they are capable of getting their daily water requirements just from the plants they eat. In short, they'll be happy to lap up some liquid water but in a pinch they really don't need to as much as other animals, especially not horses or cattle. Camels will make excellent long-distance transport animals or even draft animals. But alas, they're no horses. Yes, it's true that camel 'cavalry' has existed in various forms throughout history. But most of it has been in response to horses because of how much they hate camels. When used like cavalry, camels can be rather unwieldly in wartime situations. They're slower to accelerate, can't keep up their top speed for very long, and their high center of gravity will make sharp turns quite the prospect. It's also less convenient to swipe at people from way up there. Without the deterring, anti-horse quality, they're just big targets. Both eland species, being antelope of course, are quite athletic, but giant elands are clearly the faster of the two with a top speed of 70 km/h to the common eland's 40. At least two pages from a discount hunting agency and another hunting website claims that they can run continuously for hours, but due to the lack of clarification I'm going to assume at least some of that distance is a half-speed trot. Both species can jump several feet over vertical obstacles. Both species, while still wild animals, can easily acclimate to human presence. 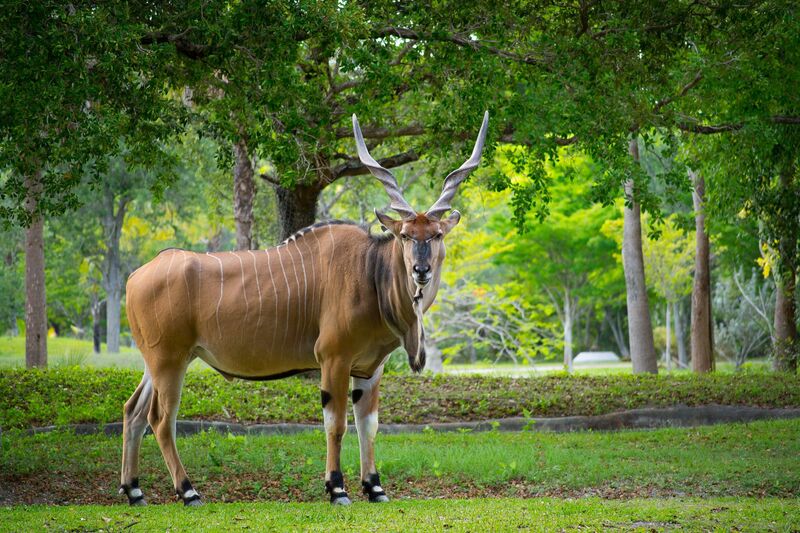 They are bred in captivity, with common eland being the popular choice for farming for meat and milk. You could probably pick either of these species. For speed, I'm not sure how extensively this has been researched; the data for common elands could come from very few observations, for example. I'd personally go for the giant eland anyway based on what we do know, and though they don't form herds quite as large I don't think it's much of an issue. Size-wise, T. oryx bulls weigh up to 942 kg versus T. derbianus' 1000 kg, which isn't much of a difference and both are quite hefty. 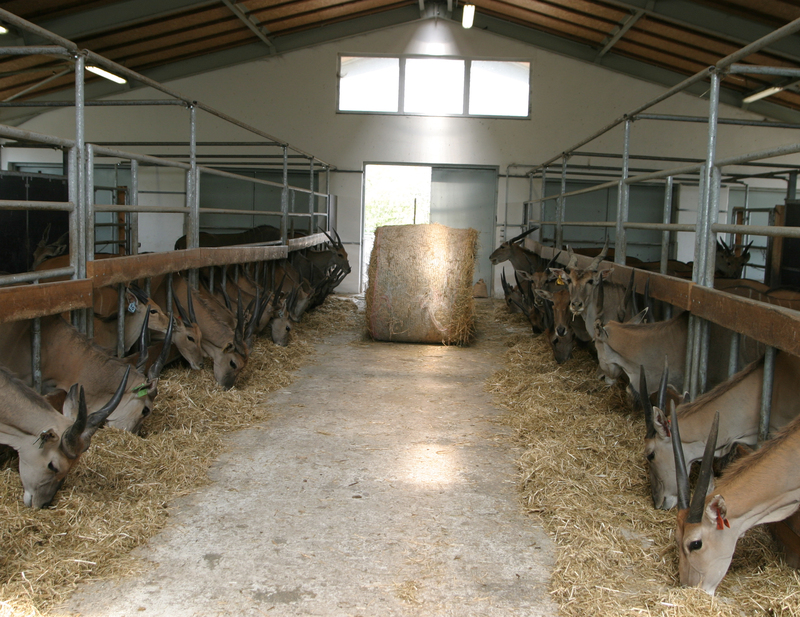 Being ruminants, elands will also be more effective at digesting plant material than horses. They consequently require less food, and elands themselves are capable of both grazing and browsing a wider range of plants than horses or cattle are used to. Exotic mounts like these can really spice up a world. (Credit: What If We Had Never Domesticated The Horse? Remember that a horse is a camel designed by a committee with all the flaws of being an imperfect camel. Horses are just cheap imitations of camels. Elephants can live in very dry climates. Since every elephant needs to drink a lot of water every day, an army or caravan using elephants would have to carefully plan its march to always be able to camp at waterholes and to carry along enough food for the elephants in really arid places. Mules are also superior to horses in many respects so possibly your people might breed mules. It is always possible that a trading caravan or army might contain several different species of transportation and riding animals, such as horses, Bactrian camels, dromedary camels, elephants, rhinos, mules, horse-zebra hybrids, cattle, bison, large goats, dogs, etc., using different species for different purposes for the most efficient operation. I've ridden camels in North Africa, the Gulf, and savanna regions of central Asia. They're taller and faster than horses and can rival for endurance. 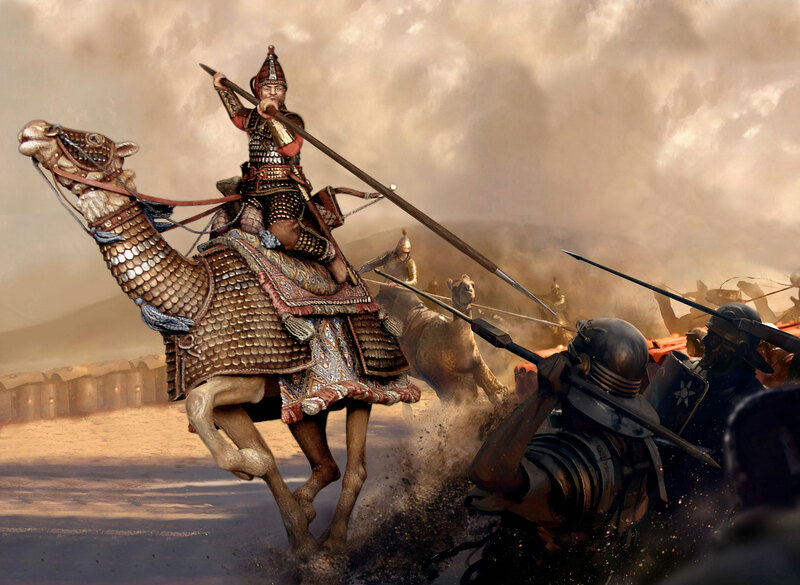 Keeping them cataphract (completely enclosed), and training them to suit your purposes, you may find the gods jealous of your camels. From this Herodian IV.14.3, Meanwhile Artabanus was upon them with his vast and powerful army composed of many cavalry and an enormous number of archers and armoured riders (kataphraktous), who fought from the backs of camels with long spears, avoiding close combat. Not the answer you're looking for? Browse other questions tagged science-based warfare fauna domestication mounts or ask your own question. How does an Alien world have Earthlike creatures? How short can Milankovitch Cycles be on a world with a stable orbit? How would eyes that evolved in air differ from our own?